Is someone you love suffering and feeling alone or have something special to celebrate? 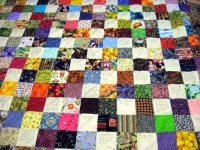 Commission a private community quilt for them. 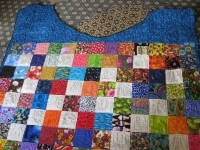 For $275 plus shipping, well make a colorful lap throw (roughly 49 x 58) with up to 20 messages on it from your group. Perfect for family groups, clubs, church groups, and other groups of people who want to let someone special know that they care. Send a message to start your project.